Snuggled in her Moby Wrap is Pringles’ favorite way to chill. Going from one child to two is both easier and harder than I expected. Easier because we’ve done this before, so the anxiety we suffered when V was brand new is mostly absent. We don’t freak out over every little cry, burp or fart. We don’t handle her like we’re going to break her. But it’s also harder because V is SO jealous and needy. I knew intellectually that was coming, but seeing it in action is painful. “Hold me, Mommy!” she whines, stretching her arms out to me every time she sees me nursing. I’m trying to include her more, but she’s had a cough for the past week and I don’t want her kissing and touching her sister a lot (doctor’s orders). Another thing that goes in the “easier than expected” column is having a baby in June when both parents are teachers. Every family should have this time away from work to adjust to and bond with a newborn. Really, we could be more European about our vacations here in America. That Protestant work ethic can be a drag. “My children.” “My daughters.” “My girls.” I’m just getting used to the plurals. And I have to get to work on that birth story while the pain and elation are still fresh in my mind. I’m feeling unexpected grief as I mourn my childbearing. We are done at two kids because of many factors: age, income, space, concern about world population and global responsibility. In my heart though, or maybe just a result of my hormones, I want another. It’s insanity, but I do. Today we will drive by the hospital on our way to Pringles’ weight check, and I will feel the stab of sorrow that I will never again enter that hospital full of excitement and anticipation. Never walk into my labor and delivery room, see the baby warmer and feel butterflies in my stomach knowing I will meet a new soul in mere hours. Never get another shot of Fentanyl after a long nine months of sobriety. Never bounce on a yoga ball and watch TV with Odie as we breathe through contractions and share our excited nervousness. Trying to hold on to moments as they pass. Impossible. The Human Condition. I hold her every second I can, even though I know I’m undermining any attempt to get her to sleep alone in a crib. I can’t help it. My last baby. I can’t let her go. This entry was posted in Essays/Commentary, Parenting, Pregnancy and tagged grief, odie, Pringles, two kids. Bookmark the permalink. New commenter– I think. Been reading for a while. Congratulations on your new beauty!!! That smell. The sounds…. I miss them oh so very much!! OMG-d my heart was aching with your description of wanting another. My baby is 5 years old (youngest of four) and I STILL feel that way ALL THE TIME! If you figure out a way to make it stop please let me know! My “big baby” is 13 and beginning to pull away and my heart aches with that feeling too. When did my heart physically grow and intertwine with my little people???? What will I do when they are all four gone….ugh…. anyone have a lick of prozac???? I just need a lick. And thanks for another cute photo of pringles… I love the Emasculator 5000, it is uber cute/cool. 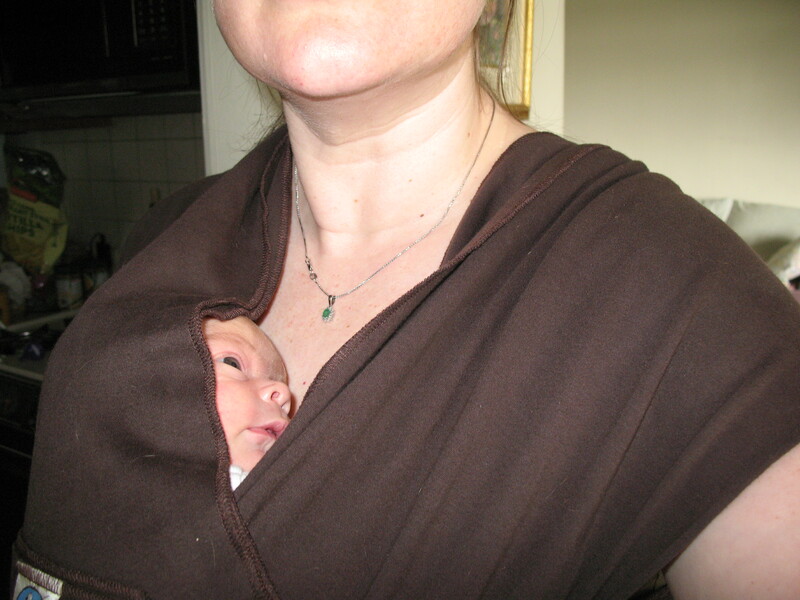 The Moby Wrap was my best friend! Now it’s the Ergo. I”ll join you in the looney bin. I have an 8 year old boy, and two horrible miscarriages in the last five years. I could probably have another child but at what cost to my sanity/my boychild’s happiness/my bank account (just being honest! )?